Most modern holidays, it seems, rely on various imports. If you do a Christmas tree, the lights and ornaments likely came from overseas, as do the wrapping paper and most of the gifts they conceal. Valentine’s Day relies on Swiss chocolates and Latin American- and Asian-grown roses. Halloween, however, remains a bastion of American-made goods. 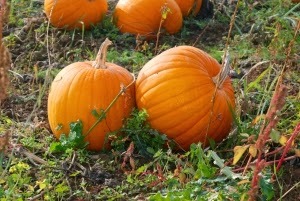 The most iconic Halloween symbol – the pumpkin – is a North American original. The squash derivative first evolved here approximately 7,000 years ago, and the traditional Halloween-style pumpkin, the Connecticut Field pumpkin, originated (not surprisingly) in the Northeast. The carved jack-o-lantern, while derived from a long British tradition of carving lanterns from vegetables, was made fashionable in the U.S. in 1866. Furthermore, if you’d rather eat a pumpkin than cut it into a disfigured grin, you’re likely going to eat a product of Illinois. According to Illinois’ Department of Agriculture, 95% of U.S. pumpkins intended for processing are grown in the Land of Lincoln. A number of other Halloween staples are also sourced from the good old U.S.A. Virtually everything you want to see in your trick-or-treat bag is made here. Hershey bars and Reese’s cups, both made by Hershey, likely come from the company’s plants in Hazelton, Hershey, or Lancaster, Pennsylvania or Illinois, Virginia, or Tennessee. Tootsie Rolls and Double Bubble gum are also made in plants in Illinois, Tennessee, Massachusetts, Pennsylvania, and Wisconsin. The stuff you hate to see in your trick-or-treat bag is made here, too – candy corn is an all-American product made primarily by Dallas, Texas-based Farley’s & Sather’s Candy Company and Fairfield, California-based Jelly Belly. And finally, should you strike out on treats and find yourself forced to play tricks, keep this in mind. Popular tree drape Charmin toilet paper was first made in Green Bay, Wisconsin and is now made primarily in a facility in Box Elder, Utah.